This was a very easy and low cost costume. All I did was find an old cardboard box and draw a picture of a magnet and cut it our with a razor blade knife. I then used spary glue and glued the red poster board to the cardboard. I then cut the excess off with the razor blade knife. I used duck tape for the magnet end and the extra poster board for the heart. I then found a picture of a duck on the internet and traced it. 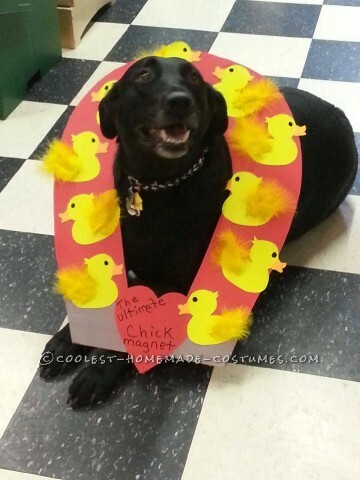 I then made cut outs of the ducks on yellow poster board then sprayed glued them to the magnet. I then used a black marker and drew in the eyes and orange construction paper for the bill. For my final step I used stick glue and glued yellow feathers on the ducks. Only took about two hours to make and about $5.